Welcome to RSGoldMine, the most secure, innovative and revolutionary RS Gold website that thousands of avid Runescape players seek to buy,sell and swap runescape gold! There’s a reason why players always turn to us for their needs, and that’s because for years, we have tuned and perfected our way of helping Runescape players around the globe to have quick, easy-to-use and safe access to Runescape gold. Whether its from our state of art interfaces that are perfectly developed and designed for hassle-free purchases and transactions, or through our incredibly cheap and competitive prices, or even from our regular giveaways and community interaction – there’s bound to be something at RSGoldMine that catches your eye! If you’re here to Buy OSRS Gold, Buy RS3 Gold, Sell RS gold, or swap Runescape gold, we hope you enjoy your time using RSGoldMine for your RS Gold needs. It’s our aim as a company and group to reach out to as many people as possible and supply them with the best services on the market, and our trained 24/7 English speaking live chat team reflect that love and gratitude every day. Why Order Runescape Gold from Us? Now – where do we start? There’s just so many reasons why thousands and thousands of Runescape players always choose us over the competitors. There’s a plethora to list – we’ll go through a few of them! For starters, we know how much you as a customer want to get to your Runescape gold and skip all the boring process in between. That’s why we base our company off customer convenience. When you buy rs gold, enjoy our easy-to-use interfaces, 24/7 English Speaking team, or the fact that we don’t ask for ID verification (no matter how big the purchase is! ), and with us being a fast OSRS Gold site it’s topped with lightning fast deliveries, you’re able to zoom through the payment processes and jump straight into your Runescape gold! There is simply no other trusted Runescape Gold site out there that matches our customer convenience and satisfaction. Proof of that is in our outstanding 9.8 out of 10 rating on Trustpilot.com, one of the world’s leading platforms in online website ratings. Now, if that’s not enough, how about the fact that we have over 11,000 positive feedback. On the topic of convenience, we know that the Runescape community uses a multitude of platforms to pay and complete transactions. Therefore, being the most convenient Runescape gold website, we strive to support almost every major money transaction platform, including PayPal, Bitcoin, iDeal, Credit/Debit Card & plenty more. In fact – we have over 30 different payment methods you can use to buy runescape gold! Also, the thought may cross your mind – ‘Is this safe to use?’ Being the world class, professional business that we are, we value the safety of our customers, and can assure our customers of complete security and minimal risk when completing transactions with us. It’s one of the many reasons why RSGoldMine is much further ahead of the other Runescape gold sites in the market. We’re proud to say that from the existence of our company, we have never (that’s right – never!) had a customer banned because of our services. 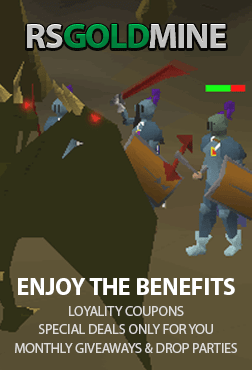 Being a legit RS Gold site, we have a state of the art protocol and system that we’ve trained our team to follow by, which includes various aspects of security such as; making sure our runescape gold is legitimate, and using legitimate and clean accounts, medium-high level accounts, with no bans, opposed to the principle of other RS Gold sites using Free to Play Level 3 accounts. As avid Old School Runescape players, we all want the next best item, or the next 99, but once we see the price it takes, we immediately get discouraged. That’s why we’re here to help players like you, who want to jump straight into the action and buy RS07 Gold! Do you really want to be slaving away at Zulrah or Raids for weeks on end, when instead you can have an unlimited source of RS Gold at your fingertips whenever you want? The team here at RSGoldMine is and will always be dedicated to providing you the cheapest Old School Runescape Gold, and in the fastest and safest way possible. Being a cheap runescape gold site, our competitive prices mean you’re always going to be getting the most bang for your buck! In addition, we, as the most convenient OSRS Gold Site out, are proud to boast about the variety of payment methods we accept. You can enjoy the pleasure to buy OSRS Gold with one of our many supported platforms, such as G2A Pay, Paypal, iDeal, Skrill, Mastercard, Visa, Bitcoin, Bancontact, Sofort Banking, Litecoin,, Bitcoin Cash, Paysafecard, Ethereum, & Neteller – with plenty more to come! We’ve been in the center of this business for years, and with our trained staff who have plenty of experience to their name, are professionals at delivering cheap osrs gold. Once you’ve ordered your rs gold, be ready to experience why we’re the most convenient Runescape gold supplier out, as you’ll be getting your OSRS Gold delivered to you within minutes and if that’s not enough, we love keeping our OSRS Gold stocks as high as we can. So, whether you need 10m, 100m or even 1000m OSRS Gold, we’ve got you covered! Try RSGoldMine to buy OSRS Gold and see why so many players continuously choose us! You’re right – that 120 Skill Cape would sure look good on you – along with that party hat. But you’ve got better things to do then slave away at PvM for hundreds of hours. Don’t worry – we feel your struggle, and we’ve got a solution, with our cheap RS3 Gold! That’s why we’re happy to say that through us, Runescape 3 Players are able to buy Runescape gold, and in whatever amount they desire! So, stop dreaming of 120 Herblore, or that Blue party hat, and head over to RSGoldMine and buy RS Gold! Now, what if you don’t have the traditional payment methods, such as Paypal or a credit card? Don’t worry – one of the great things about RSGoldMine is the multitude of payment methods we support, so there’s bound to be something that catches your eye! What are you waiting for? Go and get yourself some Cheap RS3 Gold! At RSGoldMine, we do it all! Being the best site for Runescape players to Buy Runescape Gold, we’re also the best site for Runescape players to Sell Runescape gold! Now, when Runescape players think to sell RS Gold, people think of long processes, being scammed and total inconveniences. Well we hope you’re ready to experience the exact opposite when you sell Runescape Gold with RSGoldMine – because with us, you’re in the right hands! You haven’t even heard the best part yet – when you choose to sell osrs gold – you’ll have any payment fees completely paid off by us. That’s right – experience absolutely no fees when you sell Runescape Gold with us and get the most money for your RS gold. Go on – head to our live chat to sell OSRS Gold – our team is waiting for you! We look forward to a long lasting, mutual relationship with you!